The battle over Columbia/Snake River salmon has now lasted 25 years. It has become predictable. 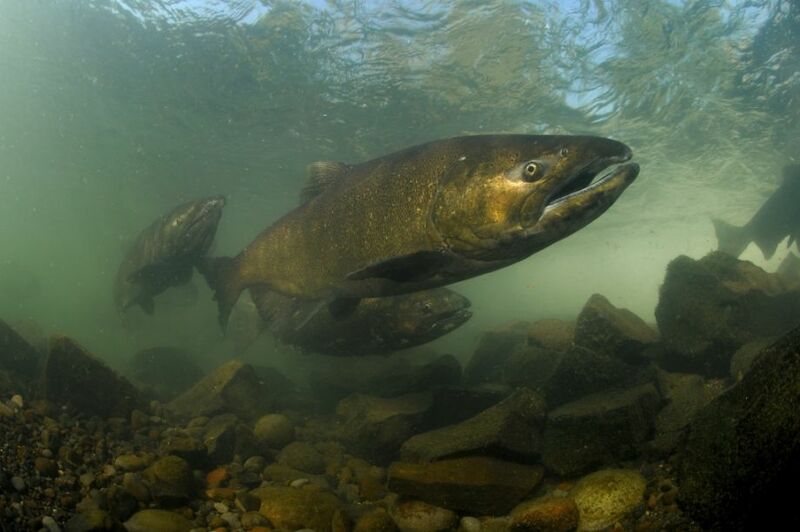 Federal agencies propose an inadequate plan for recovery of salmon runs. A federal judge rejects it. Once-mighty Columbia River and Snake River salmon runs are in a "perilous state" and U.S. government restoration efforts are "failing," a U.S. District Court judge said in a tough opinion released Wednesday. Judge Michael Simon threw out the feds' latest plan for managing the Northwest's greatest river system. The 149-page ruling by Simon is the fifth time courts have rejected federal plans as flawed or inadequate under the Endangered Species Act and the National Environmental Policy Act. The struggle over salmon has gone on since 1991, when Snake River sockeye were first classified as endangered. Thirteen other species from the river have followed in the past 25 years. The ruling by Judge Simon follows a disastrous, hot 2015 summer in which adult salmon died in reservoirs, with fewer than 5 percent reaching spawning beds in the Snake River system and even fewer in the Okanogan River. Snake River-bound adult salmon, and young salmon bound for the Pacific Ocean, must survive passage through eight dams and reservoirs. The Okanogan's runs must survive eight dams on the Columbia. Over a period of more than 20 years, wrote Judge Simon, "the federal agencies have ignored the (court) admonishments and continued to focus essentially on the same approach." He was referring to unmet promises of habitat restoration. The government's efforts have "cost billions of dollars" yet they are "failing" and leaving salmon stocks in a "perilous state," the judge added. The extent of river habitat was limited when the Grand Coulee and Chief Joseph dams were built on the Columbia River without fish ladders, and when the Snake River was dammed in upper Hells Canyon by the Idaho Power Co. But great habitat remains, notably the Salmon River in Idaho, a tributary of the Snake River that is the longest undammed river in the lower 48 states. Ex-Idaho Gov. Cecil Andrus has long argued, "Idaho has habitat, needs fish." Andrus was a skeptic when the Army Corps of Engineers built four low dams on the Snake River, turning Lewiston, Idaho, into a barge port. The feds will have to consider dam removal when they go back to the drawing board, Judge Simon ruled. He has given them until March 1, 2018 to come up with another salmon plan, or "biological opinion," as it is formally called. Any new opinion "may well require consideration of breaching, bypassing or removing one or more of the four Lower Snake River Dams," wrote the judge. The feds' latest plans were challenged by the state of Oregon -- which has taken the side of salmon restoration -- as well as the Nez Perce Tribe and conservation and wildlife groups. The plaintiffs cheered Judge Simon's ruling. "Hundreds of thousands of adult salmon died last summer because of warm water in the Columbia and Snake reservoirs," said Todd True, an attorney with Earthjustice, the environmental law group which argued the case. "The court's sharp rejection of yet another illegal federal plan for operating the dams of these rivers amplified the warning that management of these dams must change dramatically -- and very quickly -- if wild salmon are to inhabit these rivers in the future. "It's time to finally get this right. We need to seriously consider a plan that retires and removes the four Lower Snake River dams." Of course, the Columbia-Snake system supports a vast hydroelectric grid, multiple federal reclamation and irrigation projects, aluminum and other manufacturing and shipping. Northwest RiverPartners, a group that speaks for utilities, ports and agricultural interests, decried Judge Simon's ruling. "The decision potentially unwinds years of collaboration between federal agencies, Northwest states and tribes, and other stakeholders," it said in a statement. And the decision "raises a fundamental question of whether the Endangered Species Act is at all workable," it added. As long ago as 1975, at a tour of Lower Granite Dam on the Snake River, then-Gov. Andrus listened as the Army Corps of Engineers explained its plan to barge young salmon downstream around the dams. Andrus voiced skepticism, later proven out by decimation of sockeye salmon runs at remote Redfish Lake on the upper Salmon River. One year, just a single sockeye salmon -- nicknamed "Lonesome Larry" -- returned to the weir at the outlet of Redfish Lake. What was once a six-day passage to the Pacific during spring runoff became 30 days as young salmon passed through a succession of reservoirs. President George W. Bush embraced the Snake River dams, in his 2000 campaign and in the White House. He visited Ice Harbor Dam near Pasco to tout the return of salmon during a rare good year. But the river system's industrial users have faced a tough fact of life: People in the Northwest support salmon, not only on their plates but as a symbol of the region. Industry and utilities once tried to create an "astroturf" group called Northwesterners for More Fish. Its true purpose was to advocate for abandoning Snake River salmon in favor of efforts on the main Columbia. A reporter covering the story received no fewer than four leaked copies of the group's strategy document, three from within the industry camp. The federal Bonneville Power Administration more recently launched a propaganda campaign to end the so-called "fish flush" in which water is released over dams to speed up the migration of young salmon to the Pacific. It talked about the "cost" in lost spring electric power sales to the Southwest. The public wasn't buying the proposal that California hot tubs be given preference over Northwest salmon.